*5 Extras! 4 Free Downloads Design, Color, Edit, Format, Free Brother Monthly iBroidery Designs, Creative DRAWingsMy Stitch Editor Sizer Embroidery Software, Wilcom TrueSizer Format Conversion Software, Floriani Thread Color Conversion Software. Downloads. Designs in Machine Embroidery Magazine. This package includes one spool of each of these Robison Anton Tread Colors PLEASE NOTE: Colors are matched as closely as possible. Due to differences in monitors, settings, and other limitations, actual thread color may differ slightly from what is displayed. received thread order. Very happy with product. Good selection of threads with high quality. Not sure about the "free" items as little to no direction on how to obtain. Satisfied for the service & the price. I go to Allbrands first always. Excellent purchase, exactly as described and arrived quickly. Would definitely recommend to a friend and purchase from again in the future. I will recommend and use this site again. Wow! I am impressed. I placed my order on a weekend, within an hour I had a confirmation of my order. AND it was delivered within 3 days. Thank you, Thank you, Thank you! Thank you for my order for embroidery Threads. It arrived yesterday in record time, was exactly as ordered and I'm very pleased. I will certainly notify my friends of my purchase and highly recommend your site for product. Thanks again for the expedited shipment. I was well pleased with my order. It is great to be able to track the order to have an idea when it will arrive. Excellent delivery service! You had the best price I found on the internet and your reviews were good so I gave you a try. I was quite pleased with the speed of the shipping and the quality of the product. Great shopping experience! I highly recommend you and will be back! Excellent company to do business with. Product ordered was delivered in record time. I will definitely order from you again. 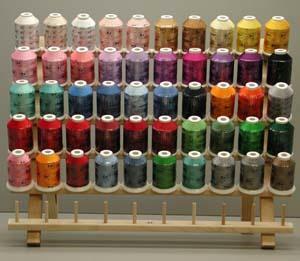 It would be nice to be able to select your own colors of thread rather than a predetermined color selection. I don't often see the rayon thread in large lots on your website and I don't use the polyester version.